The budget was an exercise in settling scores and looking after mates. Sure, it improved the nation’s finances. But at every turn it took the opportunity to punish or threaten the Coalition’s critics while protecting its supporters. Australians on benefits get their incomes cut by up to 10 per cent and in some cases 18 per cent. They will be charged for previously free visits to the doctor. Organisations that normally speak up for them such as the Council of Social Service have been told their government funding will be extended by only six months this year and then the contracts put out to tender. Big food, big tobacco and big alcohol have been thrown the carcass of the Australian National Preventive Health Agency. Like the introduction of Medicare co-payments the move won’t actually save the budget any money because the savings will be redirected to medical research, but it will please corporations which have been amongst the Coalition’s biggest backers. Coalition pets such as the banks, private health insurance industry and private schools get off lightly. The government will hand private schools $6.8 billion in the coming financial year - no cutback on what was scheduled - and $9.3 billion the following year. The private health insurance rebate survives with barely a scrape. It’ll cost $5.5 billion this coming financial year and $5.8 billion the next. And the banks profit hugely from the tens of billions of dollars handed out every year in superannuation tax concessions, also untouched. They are about to be given a second helping. Hurriedly pushed on to the back burner in March when assistant treasurer Arthur Sinodinos stepped aside over questions about his behaviour at the NSW Independent Commission Against Corruption, the government is about to revive its attempt to neuter parts of the financial advice law. It wants what the banks want. They want to remove the requirement for financial planners to always act in their clients' best interests, and they want to reintroduce limited commissions. It’s a prospect that terrifies anyone who had just watched Four Corners. On May 6 reporter Adele Ferguson examined the behaviour of the Commonwealth Bank, one of the banks that wants Labor’s new law to be watered down. It rewarded its tellers for trawling through information about their customers in order to find prospects for financial planners. “A lot of people, what they don't understand is that the teller will be looking up their details on the bank's information system, identifying if they could be sent to a planner,” a former Commonwealth planner said. “They are given targets for referrals each week. Four Corners told stories of families almost brought to ruin after the Commonwealth Bank and its representatives steered them out of safe products into dangerous ones, in some cases “without ever explaining the risks”. Labor’s law, already in place, requires financial planners to take all reasonable steps to act in the best interests of their clients. The banks and the Coalition want to water this down so they merely have to complete a checklist of six specific steps. Monash University corporate law specialist Paul Latimer told the Senate inquiry that removing the overarching best interests requirement would be like leaving doctors with only a few specific boxes to tick instead of asking them to also ensure they were acting in the best interests of their patients. And they want to allow tellers to once again receive commissions for pushing products and advisors their customers’ way. Why? Right now the big four banks with the AMP control 80 per cent of the financial planning industry. If they can’t leverage their tellers that share will shrink. And incentives work. In 2012 two economists from the Federal Reserve Bank of Chicago and Ohio State University published a study entitled Do Loan Officers’ Incentives Lead to Lax Lending Standards?. It found that loan officers whose pay was supplemented by incentives wrote 19 per cent more loans than those whose pay was not. And the loans they wrote were 28 per cent more likely to default. Incentives work, even if - in some cases, especially if - they are small. The banks need to blunt the Future of Financial Advice Act. But it’s less clear why the Australian government needs to blunt it. It’s true that banks have been big supporters of the Coalition. One of them, the National Australia Bank, employed the assistant treasurer Arthur Sinodinos as an executive after he left John Howard’s office and before he joined the Senate where he drew up the pro-bank legislation the government is about to introduce. Honest Joe has delivered a stunning first instalment. It's stunning because he has harnessed the power of compound indexation to restrain spending by more and more as each year goes by. It's the first instalment because his second, due within two years, will deal with tax. Until now, pension and disability payments have climbed twice a year in order to keep pace with wages. From 2017 (a date chosen to keep an election promise about no pension changes in the first term), they will climb more slowly in line with the consumer price index. The CPI typically climbs 2.5 per cent a year. Wages have typically climbed 3.5 per cent. The difference will create an ever-widening gap in living standards, allowing the government to save an ever-increasing pile of money. He couldn't try the same trick with family tax benefits because they are already linked to the CPI. Instead, he'll freeze them for two years. And he'll make it harder to get nearly every benefit going. This matters when it comes to government spending because benefits (so called transfer payments) make up the bulk of government spending. It's easy to talk about the cost of government, but the cost of running the government is small compared with the cost of the funds handed out. The savings won't be great to start with, all the more so because the changes to the pension will be delayed. That's why there will be a temporary budget repair levy to fill the gap. It will end in July 2017, when the changes to the pension start. What harnessing the power of compound indexation gives Hockey is a way to predict ever-greater savings right out to the end of the 10-year projection period. 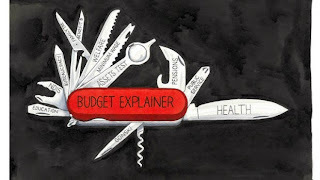 It's an honest version of the so-called "magic asterisk" trick used by his predecessor, Wayne Swan. Swan said there would be ever greater savings year by year because the government would cut spending as a proportion of gross domestic product year by year. It was a tautology rather than a plan. Treasury officials in the budget lock-up gave the impression they were glad to be free of magic asterisks and have in their place honestly-described measures that actually would cut spending. In the budget papers, they say the projections "do not assume a cap on real spending growth to achieve budget surpluses". Instead, they are built on an identifiable cut in payments growth as a result of measures actually announced. If pensioners and other recipients of benefits are smart, they will worry. Left long enough without one-off adjustments, the pension would eventually shrink to a tiny proportion of the average wage. But the first of what will probably be a series of one-off adjustments can be put off for years, until beyond the budget's 10-year time horizon. When it happens, pensioners will have to justify their demands for a catch-up increase. Until then, their benefits will climb by no more than inflation and they are likely to be happy enough because at least they will be getting what appear to be twice-yearly increases. The result, far more credible than any of the previous governments' forecasts, is an end to the budget deficit in 2018-19 and then a steady climb to a substantial surplus of 2.5 per cent of GDP by 2024-25, or 1.5 per cent if, as is more likely, some of the proceeds of bracket creep are returned in tax cuts. It would be going too far to say the savings are locked in. They depend on one incredibly important assumption - no recession for the next 10 years. Australia has already stretched it out to 22 years. An extra 10 years would mean 33, a record achieved by no other country apart from post-war Japan. Treasury secretary Martin Parkinson told a gathering of economists last month that if it were to happen, Australia could be extraordinarily proud, before adding: "It is not, however, something on which I would want to rely." Two-thirds of Honest Joe's budget savings relate to payments; only one third to revenue. That's to be expected in a budget that concentrates on spending rather than tax. A tax review will be announced before the end of the year and if its recommended measures are anything like as dramatic as the ones Hockey is imposing on spending, high-income users of the superannuation system and others enjoying tax breaks are going to find that second tough budget unsettling. And not just high earners. Hockey is doing to the states what he is doing to pensioners. From July 2017, their hospitals will be funded in accordance with Labor's generous National Health Reform Agreement, but by a formula built on the consumer price index and population growth. It will hit the states badly, given what is happening to medical costs. What will they do? He explained to journalists in the budget lock-up that they have options. Lifting the rate of the goods and services tax is one of them. It would be up to the states, he pointed out. But it would be their problem. By 2017, his tax inquiry will have made its report. It will doubtless argue the case for a higher and broader GST, as has every other inquiry that has been allowed to examine the question. (The Henry tax review wasn't allowed to examine the question.) Then it will be up to the states. Hockey might be prepared to help them. He is certainly prepared to starve them of hospital funds in order to concentrate their minds. Hockey has not delivered a horror budget. It inflicts pain only gradually, and openly. It will help get the budget back into balance. And there is more to come. A big-spending budget that delivers steadily increasing surpluses? Joe Hockey would like to see that. Michael O'Brien has managed it partly by not spending big at all. Spending will climb merely in line with inflation at 2.8 per cent in the coming financial year, and then scarcely at all (0.7 per cent) as a number of big spending initiatives wind down or are transferred elsewhere. The biggest is the National Disability Insurance Scheme. It'll be funded by Joe Hockey from 2015-16. And by us, from a higher Medicare levy beginning this July. Commonwealth-state spending partnerships on health and early childhood education are also set to expire in 2015-16 and if the Commonwealth doesn't renew them Michael O'Brien won't volunteer the money. What big spending there is is concentrated on infrastructure. But most of it won't be spent for some years, and when it is it won't immediately hurt the budget. Capital spending doesn't contribute to the surplus or deficit at the time it takes place. It contributes later via an accounting rule called 'depreciation'. Bits of the cost turn up in the budget a piece at a time over the life of the project. It’s a sort-of magic and its increasing use has seen annual depreciation expenses soar. They will climb to $2.4 billion this financial year. By 2017-18 they will be $3 billion. Interest costs would climb as well were it not for the sale of the Port of Melbourne. And that's not the only magic. The Commonwealth is coming good with two lots of $1.5 billion to fund both stages of the East West Link. The wonder of state budget accounting means both feed straight into the budget bottom line. The grants add to the surplus when they come in, but they don’t detract from it when the money comes out to build roads and railways, except for later as depreciation. Other income is rolling in. Land tax revenue will jump an extraordinary 16.9 per cent next financial year, and stamp duty 6 per cent. (To his credit the Treasurer hasn't assumed it will continue like that. How could he?) Victoria's population is climbing at the second-fastest rate in the nation after Western Australia, 1.8 per cent. It means more taxpayers and more pressure on house prices, in a sort-of virtuous revenue spiral. Tax hikes on gambling and motor vehicle registration will also help. All up, tax revenue is set to climb an exceptional 10.7 per cent next financial year and by an astounding 32 per cent in the five years to 2017-18. And that's without considering Victoria's share of the goods and services tax revenue. Next financial year Victoria will receive its lowest share in a decade - just 88.3 cents for every dollar of GST collected within its borders. But the dip is temporary and historical. It reflects the circumstances in the past, several years ago. The process of dividing up the GST revenue works slowly and with a lag. Victoria’s economy was stronger than the NSW economy several years ago and it is being punished for that, but it’s weaker now and it will be rewarded for that. By 2017-18 it should be receiving 94 cents per dollar of GST collected in (delayed) compensation. GST income will climb by about a billion a year right through to 2017-18. And Victoria’s economy is picking up. The forecasts have employment growing and state economic growth climbing from 1.6 per cent per year to 2.75 per cent by 2015-16. The budget figures aren’t as good as they look, but Joe Hockey would happily do a trade. Who in their right mind would hit anyone with an effective marginal tax rate of 94 per cent? Australia’s top personal income tax rate has never hit 80 per cent. Labor’s resource super profits tax would have been 40 per cent applied to a 28 per cent company tax rate. Labor feared that any more would take away the incentive to mine. Yet the Commission of Audit wants to hit Australians moving from the dole back into the workforce with an effective marginal tax rate of 94 per cent on wages of $19,0000 to $32,000. This would stall their reward from work at close to $19,000 even as they took second and third part-time jobs. It’s not as if the commission is unaware of the concept of incentives. It mentioned them more than 70 times in its report released last week. It even mentioned “incentives to work”. At the moment, financial incentives dive as earned income passes $18,000. That’s when the 19 per cent income tax rate comes into play as well as the 60 cents by which Newstart is withdrawn for each extra dollar earned. Where one member of an otherwise employed couple is on Newstart it can amount to an effective marginal tax rate of 79 per cent. It is a minimal return for extra work, but it is something. At recommendation 27B the commission proposes boosting the withdrawal rate from 60 per cent to 75 per cent. It says it “represents a more appropriate targeting of safety net payments”. It would also represent an effective marginal tax rate of 94 per cent. It would all but eliminate the immediate financial return for either person in that couple taking on extra work. Whether the commission realises this is unclear. It certainly doesn’t mention it. Its chief concern is saving the government money. That's fine as far as it goes, but at times it goes in the opposite direction to what the government is trying to achieve. The report begins with the commission’s 10 “Principles of Good Government”. There are exactly 10: Live within your means, protect the truly disadvantaged, respect personal responsibility; those sorts of things. What there isn’t is an attempt to address the question of what government is for and what it is trying to achieve. It is trying to achieve a lot more than protecting the truly disadvantaged. Among other things to get people into work. And to keep them alive. Which brings us to Medicare co-payments. It proposes them as a cost-saving measure: “From an economic perspective health care is like any other good or service in that utilisation increases dramatically when the marginal cost approaches zero,” it says. Doubtless true, in the short-term. The Commission says it may “help to reduce demand for unnecessary or overused services”. It would. But it would also cut demand for timely services that stop people becoming sick and save costs later on. Most of the time when we go to the doctor we don’t know whether we are seriously sick. That’s why we go. Dissuading us from going when we think we are not particularly sick will at times also dissuade us from going when it turns out we are. The massive Rand Corporation experiment in the 1970s funded tens of thousands of visits to the doctor at different rates. Some were charged large co-payments, some small ones and some none. The Americans who were asked to pay did indeed visit the doctor less. But the study found that those who who stayed away were just as likely to have serious problems as trivial ones. In its words: “Cost sharing did not seem to have a selective effect”. Neither the Rand experiment nor a later comprehensive study by Australian health economist Jeff Richardson represent the final word. But it would be nice to think the commission even read them, or even considered the impact of its recommendations on health. It’s the same for the Pharmaceutical Benefits Scheme. Pushing up co-payments would save the government money. But the commission’s own talk about price signals suggests it would also dissuade people from obtaining prescription drugs. That would be a good thing if we overused them. It would be a bad thing if we needed them. It’s a question worth considering. The tragedy of the commission’s report is that virtually none of it could be adopted without further consideration. It’s a list of ideas without an assessment of their consequences. Governments need to be responsible. It’s unfortunate that the commission subtitled its report “Towards Responsible Government”. “Australia has a serious spending problem.” Keep repeating it until you believe it. Joe Hockey has. The Treasurer was at it again on Friday in the third and final of his scene-setting speeches before the budget. “The problem at the heart of Labor's legacy was excessive spending,” he told the Australia-Israel Chamber of Commerce . It’s a good line, but it isn’t true. Spending is running somewhat higher than it was when the Coalition was last in office, that’s all. On the other hand, government revenue – most of it tax – is far lower. Australia has a big budget problem – certainly a big revenue problem - but it doesn’t yet have a spending problem. The figures for the most recent financial year tell the story. Two years beforehand in 2010-11, Treasury forecast revenue equal to 24.1 per cent of gross domestic product by 2012-13. It was a low forecast by the standards of the previous Howard government. But what the Gillard government got was 23.1 per cent of GDP, billions of dollars less. By a staggering coincidence, government spending that year amounted to exactly 24.1 per cent of GDP, precisely the same figure as the revenue it had expected to get. If revenue had rolled in as expected, the past financial year’s budget wouldn’t be in deficit in all. Wayne Swan would be crowing about his success in eliminating the deficit on time, as promised. No one is too sure where the revenue has gone. It’s a murder mystery with multiple suspects. One is a new style of tax minimisation. Cloud-based corporations such as Google, Apple, Microsoft and Amazon pay far less tax here than their bricks and mortar predecessors used to. Whether it’s Ireland, Singapore, Holland or a more exotic tax haven, they can decide where big chunks of their incomes are meant to reside and shuffle their locations at will. So far we’ve been powerless to stop them. Another is mining companies. Although big taxpayers because of the size of their operations, they have been paying a much lower proportion of their operating profits as tax than the rest of the corporate sector, about 5 to 10 percentage points less according to Treasury Secretary Martin Parkinson. Miners have been ramping up their investment spending and writing it off against their incomes quickly for tax purposes. Howard gets fingered again for what economist Saul Eslake describes as “one of the worst taxation decisions made in the past 20 years”. In his last months in office, Howard exempted entirely from tax all superannuation benefits paid to almost all Australians aged 60 and over. Even the interest earned within their funds became tax free. The parting gift cost his budget nothing but crimps revenue more and more as more and more Australians age. Another suspect is us. At times during the Howard era, households saved nothing. Income was spent as it came in. Now households as a whole save a staggering 10 per cent of their income. Much of it isn’t put in the bank, it’s used to pay down mortgages. We haven’t saved as much since 1986. It’s money largely withdrawn from the economy, money that would have once been spent on businesses that would themselves be taxed and would employ staff who would also be taxed. And we are changing the way we are spending. More of it is overseas where it escapes the goods and services tax and more is on education and health, also untouched by the GST. The GST is allocated to the states rather than the Commonwealth so the shortfall doesn't have an impact on the Commonwealth directly, but it does put it under pressure to give the states more of its diminished income. Australia goes into the budget with a projected deficit of $47 billion (a figure inflated by the government’s decision to pay $8 billion to top up the Reserve Bank’s reserve fund). Each extra year the budget remains in deficit means many more billions the government has to borrow. Net debt is now expected to peak at 16 per cent of GDP, about $280 billion. Two years ago, the forecast was for a peak of just 6 per cent of GDP, about $100 billion. Although very low by the standards of other developed countries, the forecast is an awful lot bigger than it was. By itself, the level of debt doesn’t matter much. Government debt is not like household debt. When you or I have a debt it is usually owed to a single institution, the one that provides our mortgage. We have no choice but to pay it off, either by making the payment in full or by dying and having it taken out of our estate. But governments aren’t like people. They are more like corporations with a multitude borrowings, each paid off when it falls due and each overlapping. There is no such thing as “the” government debt. Instead it is like the water in a bath being kept warm as old water escapes and new water flows in. The volume of water in the bath may not change, but the composition changes all the time. Lenders lend and get repaid continuously. And, unlike people, governments never die. There is never an end point at which “the government debt” has to be extinguished. It’s just as well it did. When the financial crisis hit, the Rudd government decided to borrow big time. Had the Australian government not kept its debt market open it would have found that difficult in the circumstances of the time. Few would now argue the government should be entirely debt free. Although by itself the level of debt doesn’t matter much, it matters for what it does to the annual budget deficit. Once negligible, net interest payments are now about $9 billion. That’s an extra expense the budget didn’t used to have. It is set to climb to $13 billion in two years’ time as more deficits mean more borrowing, which means even bigger interest payments in future budgets. The scale of the interest bill can be seen by comparing it to other government expenses. At 2.2 per cent of spending, $9 billion is the same as the sum the government spends on non-government schools, on residential aged care and on Newstart. Truly massive in the context of government spending, it’s about one half the size of Medicare and one third the size of the biggest program of all – the age pension. Unless something happens to drive that interest bill down, the government will be increasingly constrained in what it can do. The only way to drive it down (short of a cut in interest rates) is to start running budget surpluses. That’s why it’s talking about temporary taxes and slowing increases in the pension. It’s why the budget will be unpleasant. It’s true the problem would disappear if revenue simply snapped back to where it used to be as a proportion of the economy. But this government can no more whistle up Howard-era revenue than could the last one. Something has changed in the way the economy works and government has to change too.